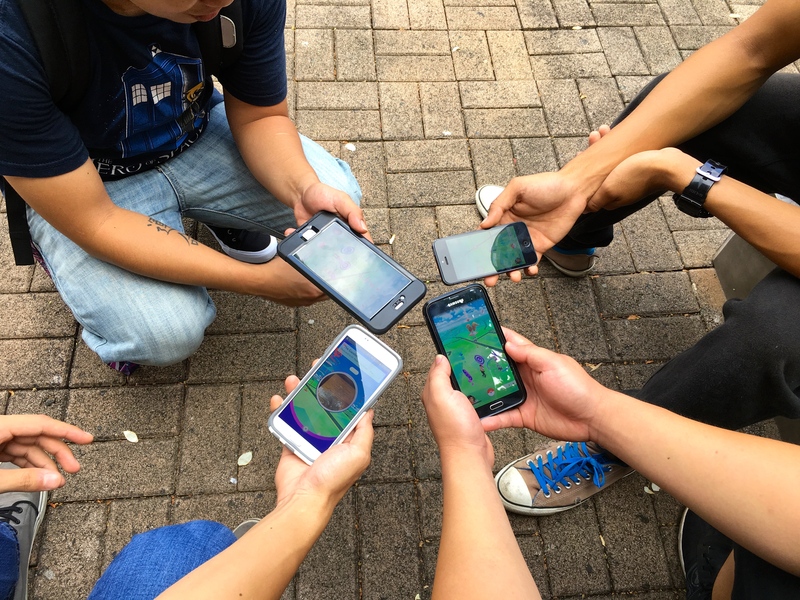 HonCC students playing Pokemon Go on their mobile devices. Honolulu Community College is on the go thanks to the information technology mobile development team at Kapi‘olani Community College. The Honolulu CC mobile app, found on the Apple Store and Google Play Store, will allow students to keep track of their class schedules, find their way around campus, and have contact information at their fingertips to student support services. The mobile app will make its campus debut this week. According to the Pew Research Center 64% of American adults in 2015 owned a smartphone of some kind, up from 35% in the spring of 2011. Besides texting, calling and basic internet browsing, 30% of smartphone owners use their phones to take a class or get educational content. Technology is growing at an extraordinary rate, and for Millenials and Generation Z, technology is a part of their daily lives. “The idea for a mobile application arose as a suggestion from the student council in November 2014. We started working on the application in January of 2015 and by fall of that year we released the app to Kapi‘olani Community College,” explains Craig Spurrier, developer and programmer at Kapi‘olani CC. The other members of the mobile application development team include Raphael Lowe, interface designer; Kevin Andreshak, tech operations coordinator; and Brett Botbyl, cartographer. The team worked closely with Banner Central at the University of Hawai‘i System’s office to integrate student information for the app. Since the app launched in the fall of 2015 there have been 2,100 downloads on the iOS and 908 on Android. Approximately 20% of Kapi‘olani CC students use the mobile app. Some of the main features that student users mentioned using includes an informational campus map, access to class availability, and the ‘how do I’ section. “In the upcoming year most of the focus will be a full University of Hawai‘i Community College System rollout with Honolulu Community College as the second campus to adopt the application. As our ability to collaborate with the developers of STAR, the online registration and advising platform for the UH System, and other UH groups expand, we’re hopeful the app will function as a new bridge for students to get vital information they need in this mobile format,” shares Raphael Lowe.